I totally just found that book at Books A Million this weekend! It came in a set though, with 2 socks and some other accessories. Blair wanted to get it for me but I told him I'd experiment a bit more too. Sadly, socktopi are pretty common (but I'm still gonna try it!). 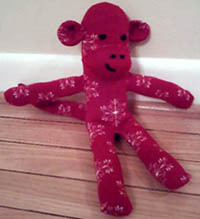 Now I'm thinking of adding a sock spider to my queue... and perhaps even a squid!